Magic, monsters and Gimli’s voice echoing off the walls—you’re not in the Mines of Moria: it’s Hal-Con. Hal-Con took over the World Trade and Convention Centre between Oct 26 and 28. I was one of the 5,000 people who descended upon the centre to spend a weekend gaming, socializing and geeking out. But I wasn’t sure what to expect. “I wait all year for this,” says Kaleigh Embree, an archaeology student at Saint Mary’s University who is appropriately in costume as Lara Croft. She’s already got her costume for next year planned out: Indiana Jones. At Hal-Con you can go to seminars on tea making, zombie slaying and board game strategy. There are concerts and circus shows, tournaments and meet-ups. The iconic image of the convention is the guy in costume. And yep, there are folks from World of Warcraft, Master Chief from Halo, fur suits, Sherlock Holmes and Watson, even a guy in a seven-foot-tall feudal Japanese take on Iron Man. There’s probably 100 feet of Doctor Who scarves in the convention at any given moment. Nathan Tey and Susan May are two students who’ve gone all out on their outfits. “You can’t walk 10 metres without someone asking to take a photo of you,” says Tey. They estimate that since August, they’ve spent somewhere between 100 and 150 hours fashioning their (glowing!) sets of armor. 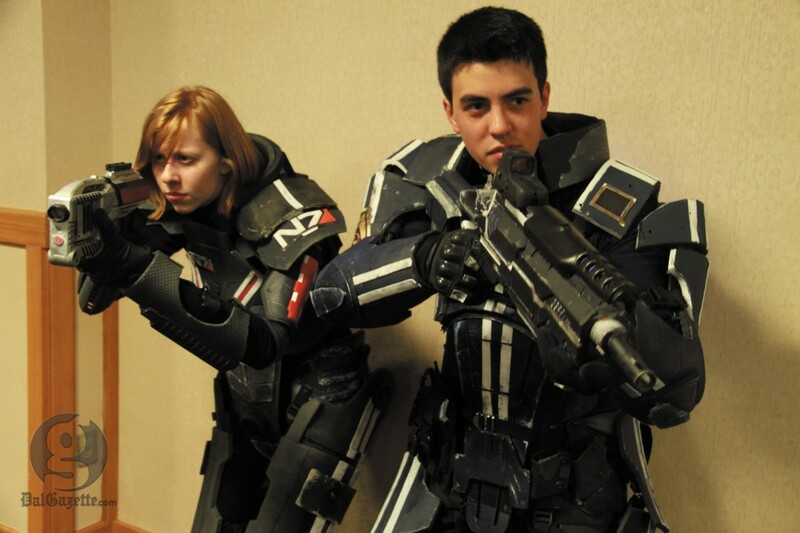 They’re characters from the video game Mass Effect—Commander Shepard and her (potential) love interest, Kaidan. “It’s kinda romantic,” says Tey. They love the Mass Effect games, but haven’t gotten into the books and comics. “The extended universe is a bit too much,” says Tey. “There are different levels of nerd,” adds May. This metaphor turns out to be a pretty apt description of Hal-Con. It’s stratified into three distinct levels. The top is for gamers. The middle is where the panels take place. The bottom floor is dedicated to selling stuff, from corsets to comics to old game cartridges. Jerry Ross is the largest comic book vendor at Hal-Con. He and his 35,000 comics occupy a sizable chuck of the first floor. Ross has been in the business since the 60s, and specializes in early Marvel comics. Take the escalator up to the second floor, and you’ll find he’s only partially right. There are lots of awesome comic panels and artists’ booths at Hal-Con. But it’s one crowd amongst many: Trekkies, Whovians, gamers. Zombie enthusiasts. The guests headlining Hal-Con are just as varied: John Rhys-Davies (Gimli from The Lord of the Rings movies; Sallah from the Indiana Jones movies), René Auberjonois (Odo from Star Trek) and Nicholas Briggs (a voice actor most known for the Daleks of Doctor Who). One volunteer tells me Hal-Con is hoping to get George R. R. Martin, the writer of A Game of Thrones, to headline next year. The most distinctive (and perhaps best dressed) subset of nerd culture at Hal-Con is the steampunk contingent. They’ve erected a life-size replica of the interior of the Nautilus, from Jules Verne’s 20,000 Leagues Under the Sea. Andrew Aulenback is the treasurer of the Jules Verne Phantastical Society, Halifax’s largest steampunk community. I ask him what he thinks Hal-Con is about: comics, or TV shows? “Have you been upstairs? 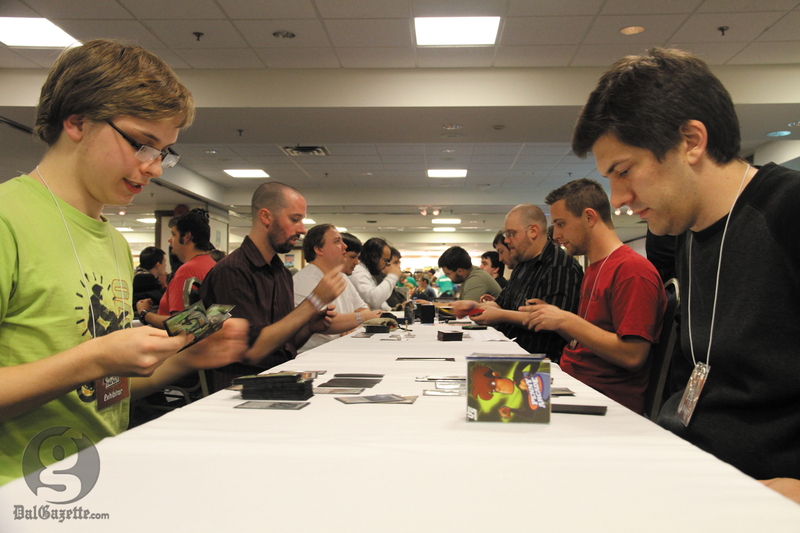 It’s a board game convention with a bunch of other stuff tacked on,” he says. Head up the escalators to the third floor and, yep, there are a few obvious differences: fewer costumes, better lighting, more chairs. Tables are everywhere, covered in white cloth. Dan Beyersbergen and a couple of friends flew in from Edmonton just to play Axis and Allies, a World War Two-era super-sized board game, with his friends. This will be his second year at the convention. Just a few tables over, Mitchel Dorcas and Andrew Cheney have just finished their match in the Warhammer 40k tournament, a strategy game requiring hand-built and painted armies, six-sided die, and a hugely complex set of rules. Dorcas is from Fredericton, and came to Hal-Con for the tournament. He’s barely left the third floor.